Film Walrus Reviews: Knee-jerk Response to Who Can Kill a Child? 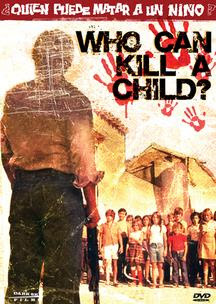 To a giallo fan like myself, a title like “Who Can Kill a Child?” (1976) has an immediate ring of trashy B-horror intrigue. The plot only confirms the potential: British tourists find themselves trapped on a remote island where children have inexplicably slaughters the adult population. I thought my odds were pretty decent of viewing a mildly outrageous cult gem. There is no shortage of interesting films about creepy children, whether they are hell-spawned, possessed or simply sadistic. It would be a great topic for a list some day. “Who Can Kill a Child,” however, would be left off it. The film answers its titular question in its overlong and totally tasteless intro. The answer, as a series of exploitive newsreel footage shows us, is surprisingly straightforward: Nazis can kill children. Also disease. And malnutrition. Malnutrition got a lot of them. None of this has almost anything to do with the rest of the movie. After about ten minutes, the director finally condescends to provide a movie. We are introduced to married couple Tom and Evelyn, two of the ugliest and dullest people ever to stumble through a horror movie, and this from a decade (the 1970’s) not known for beauty and charm. My sixth sense for low-budget horror crappiness began to tingle, preparing me for the forty minutes of sheer boredom that would precede the first actual horror scene. By the time we find out that the children are evil (I guess it is supposed to be a surprise… so sorry if I ruined it for you) there have already been so many hints that the director must have suspected (correctly) that his audience would be comatose within the first few scenes. There is almost no actual payoff accompanying the revelation, as the children are completely flat and senseless, apparently too drowsy and preoccupied to muster the menace required by the premise. I respect keeping the source and motivation of their violent coup a mystery, but I wish there had been some rhyme or reason for their particular actions throughout the film. The children are entirely unrealistic, behaving more like an aloof misanthrope’s idea of children rather than an exaggeration or a corruption of the real thing. They are slow, quiet, stupid and uniform. They work in groups without any coordination. They seem to survive without any trouble despite never doing any work. Most egregious of all, they are infinitely uninspiring as sources of fear, shock or interest. Director Serrador can’t seem to make up his mind whether they are supposed to be zombies, rebels or just confused kids who let things get out of control. He makes a few attempts to imply that they are some sort of avenging force, eradicating the adult world that has led to nothing but misery, yet these vague pretensions come off as half-baked. There is one good scene. For anyone who is interested, I will spoil it now. Tom walks into a barn where the children are playing. A blindfolded girl swings a rapier at a piñata while the crowd laughs and cheers. As the camera tilts up, we see that the piñata is actually an old man. Yeah, it’s kind of sick, but it is one of the few scenes that actually succeeds as horror. After that shot, Serrador clearly has no idea where else to go and wastes the remaining hour of the film having his leads lamely putz from one indistinguishable empty set to another. It doesn’t help that the lead couple balks at the mere thought of acting and there are very few characters to share the burden (or at the very least, to provide intermittent gruesome slayings). The sun-baked Spanish island has zero personality and the cinematographer has no intention of creating atmosphere where plains of dust and whitewash walls have already failed. The pacing actually feels slower than real-time. I’m guessing that very few of you out there were in any danger of seeing this film, but I warn you against it just in case. And for those of you who think you would never watch a film called anything like “Who Can Kill a Child,” keep in mind that sleazy distributors will stop at nothing to sell their films, even going so far as to use titles like “¿Quién puede matar a un niño?” to confuse you. “Oh,” you might say to yourself, “that must be a foreign title. Perhaps it’s a masterpiece by Ingmar Bergman or Akira Kurosawa?” No. No it is not. As if you wouldn't pay to see Ingmar Bergman's version of this. Who Could Kill Fanny and Alexander?